Dental care has made giant leaps over the years, but because of things like trauma or tooth decay and periodontal disease caused by poor oral health many patients still suffer from tooth loss. Often dental implants provide a far superior option for patients with missing teeth as opposed to bridges which require grinding down the two adjacent teeth and using them as anchors for a three-tooth bridge or dentures which require constant maintenance and replacement every few years among a host of other annoying issues. Dental Implants are a bio-compatible titanium platform designed to act like your tooth’s natural roots that provide a permanent base for replacement teeth. 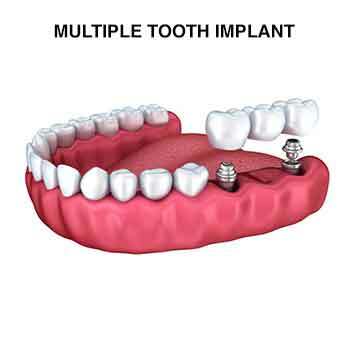 The implants we use are made of medical-grade titanium that, over time, fuses to your jawbone below the gums. You can replace a single tooth, multiple teeth or a full upper and or lower set of teeth. Because dental implants perform, look and feel just like natural teeth, they are the preferred option for tooth replacement in our office and leading dental practices across the country. In fact, Dr. Mark McOmie & Dr. Ellen McOmie have been at the forefront of implant dentistry for many years and performs hundreds of implants each year which tells you just how experienced our office is at performing dental implant surgery. Most general dentists just don’t have the expertise or experience to perform successful implant procedures, and on average only 10-15% of all dentists offer them. Dental implants are an outstanding solution for badly damaged or missing teeth and an excellent replacement for the missing tooth’s roots. Implants offer a solid foundation for removable or permanent replacement teeth and are constructed to resemble your natural teeth’s appearance. Implants are fabricated from titanium, which is lightweight, strong and biocompatible, which means your body is less likely to reject it. Tooth loss can occur for many reasons, including periodontal disease, cavities or trauma. It’s an interesting fact that by age 17, more than 7 percent of children in the U.S. have lost at least one permanent tooth; and most Americans by age 50 have lost an average of 12 teeth? Implant dentistry is by far the most advanced therapy available to replace missing teeth. 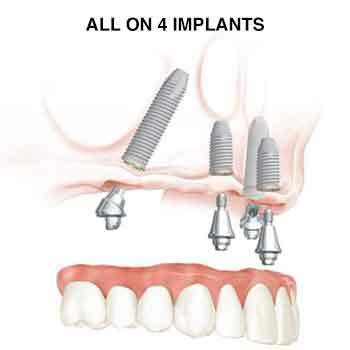 Dental implant restorations look, feel and act like natural teeth. They act just like a natural tooth root to anchor restorations in the mouth. Dental implants may offer you significant advantages compared to other treatment options: improved bone health and enhanced appearance, which may lead to greater self-confidence and a better quality of life. Because they look and feel just like your teeth dental implants can greatly enhance your appearance. Implants become strong permanent teeth because they fuse with the jawbone. This also protects bone which would normally be lost in spaces where teeth are missing. That loss of bone changes the contours of the face and weakens the bones around it. One of the biggest results from dental implants is the improvement of your self-esteem when you can finally proudly smile again. Since implants don’t require drilling surrounding teeth, as a tooth-supported bridge does, more of your existing natural teeth are left intact, improving long-term oral health. Implants are notably tough and long lasting, and with good care, most implants can last a lifetime. The implant: A screw that replaces the root from your natural missing tooth by permanently attaching to your jaw and serves as the anchor for your new teeth. The abutment: A connector that’s used to attach a crown, bridge, or removable denture to the dental implant fixture. The crown: This visible part of the tooth. It’s commonly made of porcelain or zirconium for overall visual appearance and durability. Endosteal implants — These are surgically implanted directly into the jawbone. Once the surrounding gum tissue has healed, a second surgery is needed to connect a post to the original implant. Finally, an artificial tooth (or teeth) is attached to the post individually or grouped on a bridge or denture. Subperiosteal implants — This type of implant is not used anymore and was part of the evolution of implant dentistry. Mini Implants — These are small diameter implants. Any implant with a diameter under 3mm is a mini implant. Mini implants can be used for retention of a denture, a partial, small crowns. These implants cost about 1/3 as much as a full body implant and can be a cost effective solution for stabilizing a loose denture. 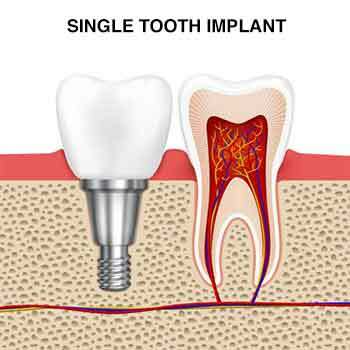 What Is Single Tooth Implant Replacement? If you are missing one tooth in a given area of your mouth, your dentist may recommend that you consider one dental implant to replace the root of the missing tooth and an implant crown to rebuild your tooth in a beautiful and natural looking manner. An implant with an implant crown offers a long-lasting solution for a missing tooth and does not require anchorage to any adjacent teeth. 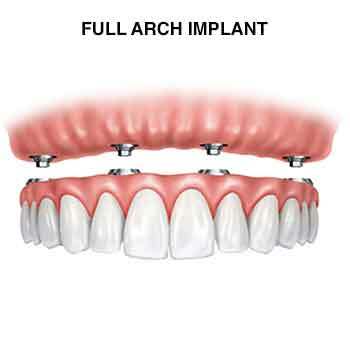 When all teeth are missing or so badly damaged that they need to be replaced, a full arch replacement using a fixed bridge anchored to dental implants is an excellent permanent solution. Not only is it possible to replace all of your teeth, but it functions just like your natural teeth allowing you to eat normally and provides a reliable, solid solution that will not only last you a lifetime but prevent bone loss and help preserve your facial appearance. If you need to replace your upper and lower denture with implant supported dentures we usually employ what’s called All-on-4. The All-on-4 procedure is used to replace an upper or lower regular denture with a fixed denture that is supported using four implants. This method is based on the way the implants are angled, as the two at the front of the mouth are placed at a 90° angle, while the two on either side are placed tilted backward at a 45° angle in order to maximize the use of available bone to hold the denture securely in place. This is a specialized technique that requires additional training and Dr. McOmie is highly skilled at performing. Most patients agree there is very minor discomfort connected to the procedure and say that implants involve less pain than having a tooth pulled. Practicing good oral hygiene, like brushing twice a day, flossing, rinsing with an antibacterial mouthwash, and regular checkups and cleanings are essential to prolonging the life of your restoration. Every patient and their custom treatment plans are unique to each patient’s needs, so the appointments, procedures and cost vary accordingly. After an initial appointment and assessment, Dr. McOmie will provide you with a treatment plan including the cost and expected number of appointments. Because there is no better option to restore missing teeth dental implants are a long-term investment that affects everything from your smile and confidence, to your ability to eat, speak and enjoy your favorite activities. Most dental insurance has implant coverage these days. Dental implants are considered the standard of care in the United States.. If your dental insurance company doesn’t offer coverage, sometimes they will give you an allowance towards implants equivalent to the cost of a bridge or regular dentures. Our friendly staff can help you understand your insurance benefits and if you have existing coverage for implants. We also offer easy financing and payment options. Dental implants are proven safe and have been done for decades. Like any surgery, dental implant surgery poses some health risks. Problems are uncommon and are typically minor and easily treated. Complications from dental implant surgery risks may be higher for patients who have other medical conditions or smoke. Risks include damage to other teeth, tooth roots, sinus problems; infection generally treated with medication; fractures; nerve damage that can result in tingling, numbness or pain; inability to complete the implant due to inadequate surrounding jawbone; and implant failure. It’s important to share your health history and habits with Dr. McOmie to discuss the risks involved. Contact us today to see if implants are right for you and we can develop an individualized treatment plan.